Happy Halloween! We hope you enjoyed this year's event. As usual, we offer those who took their time to collect pumpkins a special price. Here is a list of our year's top collectors. 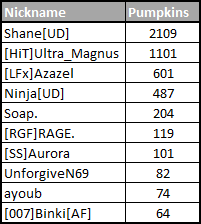 Shane[UD] won a 3 month donor level 2 for collecting 2109 Pumpkins! See you next year everyone! Go Shane! Wow, +2k pumpinks. Got like... nine. Pretty happy with the result though. Current time: 04-19-2019, 03:32 PM Powered By MyBB, © 2002-2019 MyBB Group. Theme core by MyBBDesign.